Once you have selected your cigar, you will need to cut the closed end. All Havanas have a double cap over the head end - this end goes in your mouth. If you attempt to smoke a cigar the other way around, you will find that half way through it will unravel and take on the appearance of an exploded stick. There are a number of ways of cutting the cap, ranging from the use of a thumb-nail, to portable guillotine cutters (both single and double bladed - see 'Accessories'), from cheap to expensive, to the more exotic cigar scissors and table-top cutters. The cut should be clean and level, or there will be difficulties with the draw and a risk of damaging the wrapper. Cut the cigar so that an eighth of an inch of the cap is left around the cigar wrapper. It is not recommended that you pierce the cap with a pin, as this will interfere with the passage of smoke, make the cigar overheat and lead to unpleasant flavours from residues condensing at the point the cap was pierced. Cap hole-punching devices do work well as long as the diameter of the punch is at least a quarter of an inch. 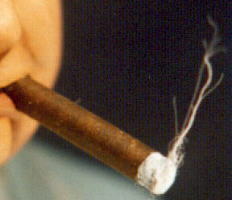 Wedge-shaped cutters are also not recommended, as these have a tendency to cut through all of the band on either side and the cigar wrapper can then unravel. Whatever you use, make sure it is sharp, and that you expose enough of the filler leaves under the cap to allow the smoke uninterrupted passage. When you light a cigar, use either a butane lighter (not one filled with gasoline) or a match. Anything else, such as using a candle, will tend to taint the flavour of the cigar, and will ultimately impede the passage of smoke through the cigar with particles from the flame. Avoid matches with high sulphur or wax contact (don't use paper matches). Take time and care to light the cigar. Cigars are made from long filler tobacco leaves (another difference to cigarettes and machine made cigars). 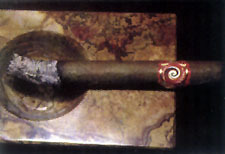 This means that the ash on the cigar, if it is a good one, should not fall off the moment it appears. There is no particular merit in keeping a long ash on a cigar, but neither is there any need to continually tap it to remove any excess ash. In assessing the quality of construction of your cigar, a long solid cylinder of ash is a good sign. 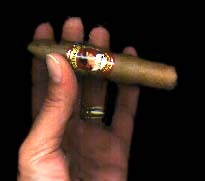 There is no need to warm the length of the cigar before smoking it. This was done in the nineteenth century to burn off the rather unpleasant gum used on some cigars made in Seville. Today's handmade Cuban cigars use a small drop of flavourless, odourless vegetable gum at the cap end of the wrapper leaf. The final third of your cigar will be when the smoke is at its strongest. This is the time to part company before flavours become bitter and the effect of the cigar on your well-being may become detrimental. There is absolutely no need to stub or grind a cigar out to extinguish it. Left in the ashtray it will go out by itself: if you stub it out, it will release foul odours into the room. Once the cigar has self-extinguished remove any butts and ash from the room before they start to give out unpleasant smells (i.e. before going to bed! ).